Henry Philemon Attwater was born in Brighton, England and spent his early adult years in Canada, but the state of Texas – which he first visited at 30 and made his permanent home at 35 – has embraced him. A sometimes beekeeper and failed museum proprietor, devoted to collecting and preparing natural history specimens, the Texas State Historical Association recognizes him chiefly for his contributions to conservation. Indeed, the TSHA, with outsized Texan pride, attributes to him directorship of the National Audubon Society starting in or about 1900 – although that organization would not formally exist until 1905. Regardless of such tall tales, Attwater was in truth an avid conservationist. His obituary in The Auk describes him as “without a doubt” responsible for Texas’ laws on bird conservation, “for he was the first in the state to present the real facts concerning the importance of bird life in its relation to human welfare.” His publications included 1903’s Boll Weevils and Birds and 1914’s Use and Value of Wild Birds to Texas Farmers and Stockmen and Fruit and Truck Growers, pragmatic titles that emphasized the usefulness of wildlife. In 1892 he also wrote a brief note for The Auk entitled “Warblers destroyed by a ‘Norther'”, recounting how a three-day spring storm had wiped out a large number of Black-and-White Warblers, Northern Parulas, and Sycamore Warblers (a subspecies of Yellow-throated Warbler) in his Rockport neighborhood. This last is particularly poignant, if not a bit eerie, for the modern conservationist. Rockport, of course, was recently pounded by another and substantially more intense storm. While most reporting on Hurricane Harvey has rightfully focused on the human tragedy, concerns for the ecosystems of the area are many. The International Crane Foundation’s Rockport outpost was wiped out, and the Whooping Cranes who will arrive next month for the winter may find polluted waters and damaged populations of blue crabs, a vital food source. Migrants attempting to pass around or over the Gulf are faced with downed trees and stripped vegetation (though some insectivores may benefit from a suddenly booming population of mosquitoes). And then there’s Attwater’s Prairie Chicken. 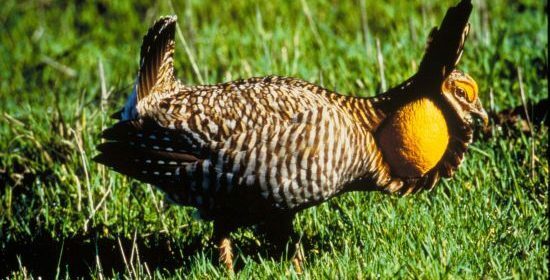 A distinct subspecies of Greater Prairie Chicken that once numbered a million strong and called coastal grasslands from Louisiana to the Mexican border home, it was more than decimated by development in its native habitat, with less than 50 birds left in the wild in 1996. Years of government protection and the hard work of dedicated conservationists only brought this number tenuously into the hundreds, with success fluctuating from year to year. The species still lives in the wild in only two locations, on its namesake National Wildlife Refuge and on a private holding not far away – and both are now threatened by the fire ants displaced in Harvey’s floods. 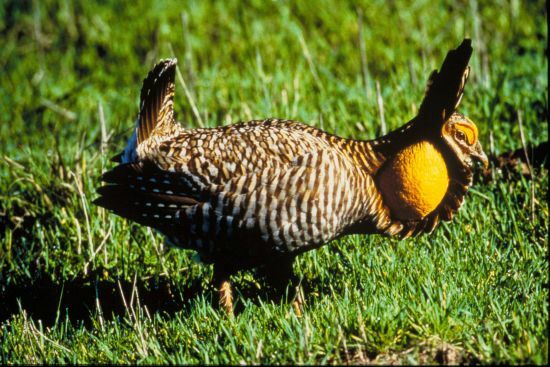 Competition with invasive fire ants for insect food is a major source of mortality for young Attwater’s Prairie Chickens. Perhaps the bitterest irony is that had more habitat been left for the Attwater’s Prairie Chicken, humans might have fared better under Harvey’s lash. Undeveloped coastal habitats aren’t only vital to birds and other wildlife, they also provide a buffer against wind and water when hurricanes strike. Undeveloped land absorbs water, filters salt, and slows wind. Perhaps if Henry Philemon Attwater were alive today, he would write something about it. Birding Dilemma No.23 – Taking family for granted.